This trip certainly made up for the past two years!! Generally great weather, but lots of bugs. It took us 12 days on the water and we covered about 310 km. We drove to Mattice and were shuttled to Hearst by Denyse Korpela of Missinaibi Outfitters. After about 4 hours on the train, we put in at the Hawk Junction bridge. En route, we saw a couple of moose and the train crew were more than accommodating. 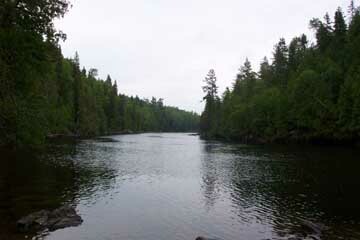 We were headed through Blue Bay into Manitowik Lake when the wind increased enough that we could use the sail. 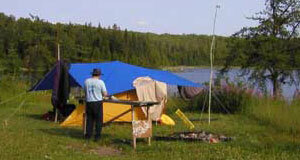 We sailed the length of Manitowik Lake and camped on the island in Dingman Bay. 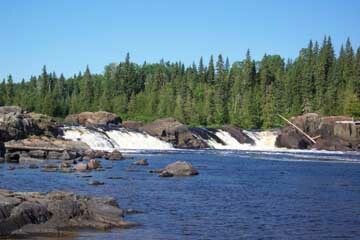 Stony Falls Portage and Little Stony Portage took us into Dog Lake. 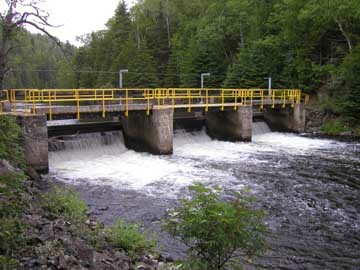 Water level control dams like this appear periodically where you might not expect them. 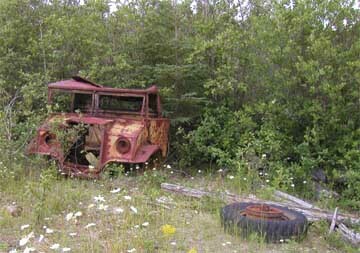 This one had been recently refurbished. 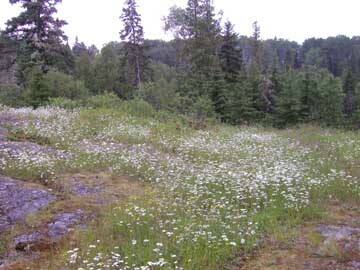 Part way across the portages, we encountered a small meadow which had quite an array of flowers. Although this may look a little bleak, it meant that we had enough wind to sail Dog Lake into the 'town' of Missinabie! 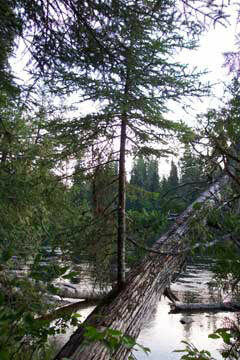 The crossing of Dog Lake was a bit nerve wracking at times. 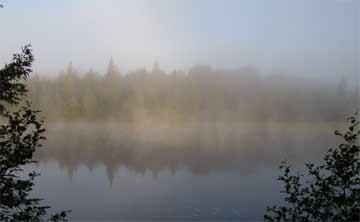 The length of the lake and the wind direction meant large rollers. 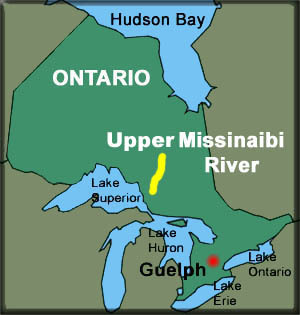 The weather closed in and it was raining when we arrived in Missinaibie, so we stayed at the campground that night. The next morning, we decided to use the newly acquired spray cover for the day. It certainly kept us dry! 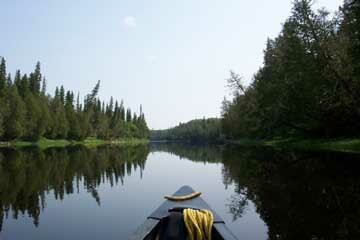 We sailed through part of Dog Lake to the Height of Land portage. 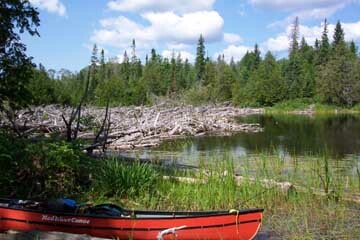 After paddling and sailing Crooked Lake, which actually is quite straight, we pulled in at the site of an old logging operation. 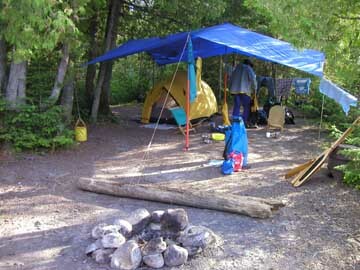 The bush remains cleared and provides a great campsite. 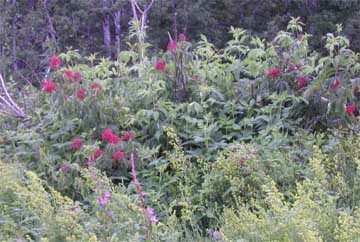 The clearing of the land allows new, varied growth to occur. 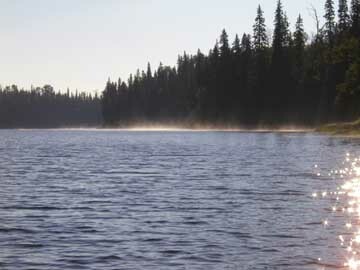 We saw a moose cow and calf after supper across the river and a bull moose early the next morning. 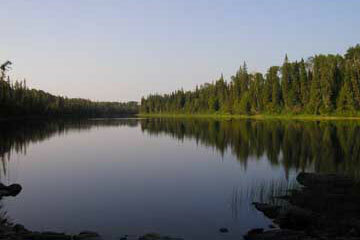 Once the Missinaibi portage was completed, we cut across the lake from Red Granite point and rounded Fairy Point. The water was very rough (big waves, cross winds, etc.) and held our attention, so we only got a few glimpses of the petroglyphs as we roller coastered by. The sail up Barclay Bay was a bit rough, but at least the wind was at our back. 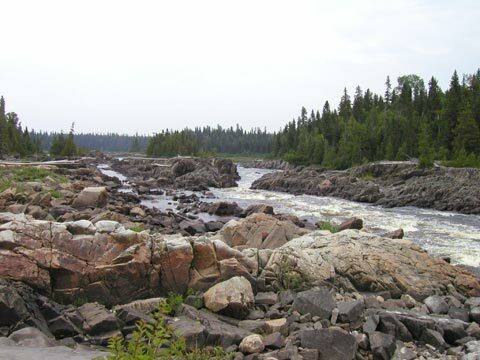 We pulled into Missinaibi Lake Provincial Park and stayed the night in a group camping area. The camp staff were very friendly and it sounded like they had done quite a bit of work on the campsites/portages along the river. In the ensuing days, we were impressed by their efforts! After leaving the park campground, we sailed briefly and the wind changed. 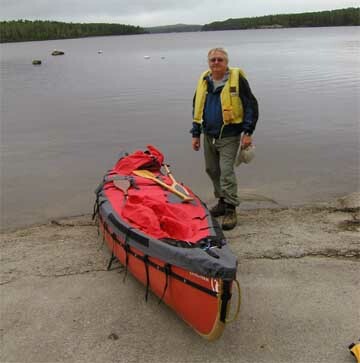 We battled along the north shore of Barclay Bay into the wind - quite rough across a couple of bays! There are a lot of reed beds in the shallows throughout this section. The spray skirt, although put on a bit late, did lessen the affect of the rain. 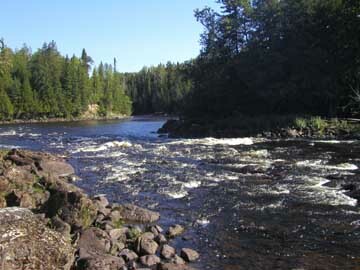 We did about 30 km before camping below Long Rapids. We awoke to ice on the tarp and tent! -2 Celcius!! The upside was that there were no bugs. Sun Rapids looked a bit too rocky, so we portaged. 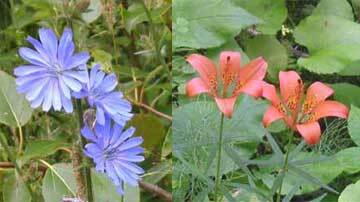 Another example of the flora - wood lilies and asters. 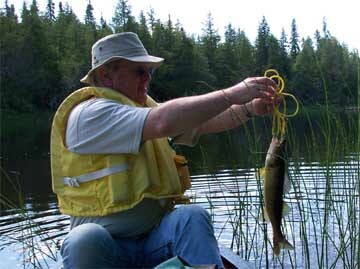 Supper included some delicious walleye! 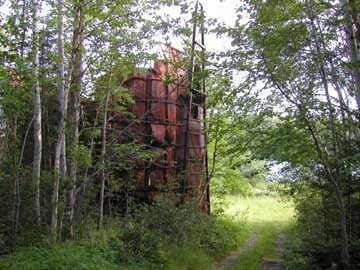 At Peterbell, quite a bit of the old logging material remains. 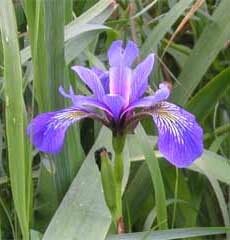 When you are looking for the campsite in the Peterbell marsh, look over to the east past the reed beds. The site is excellent! A set of heavy clouds went by and we narrowly missed the rain. The sunset capped an excellent day. We went to the west (right) of Allan Island, pulled over a large tree blocking the river, and portaged around this log jam. We ran Wavy Rapids and took on a bit of water. It was a warm day, so we dried off fairly quickly. 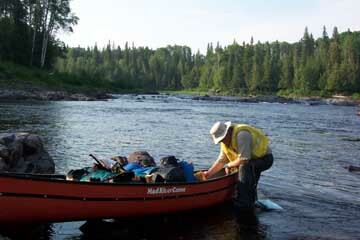 At the bottom of the Greenhill Portage was an excellent campsite. 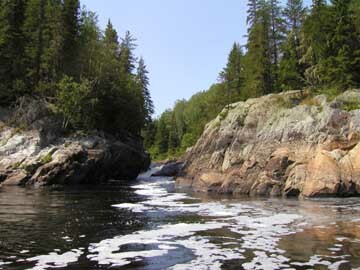 We did the portage, which was hilly at both ends. The center section has new boardwalks in place, making it a lot easier. 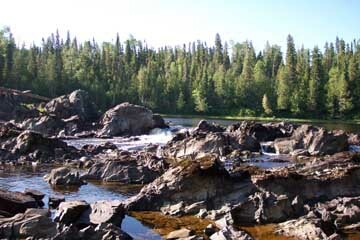 The river churns through Split Rock - a gap about 8 or 10 feet wide here. 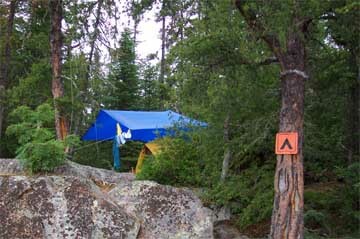 Just below Thunder Falls, on the west side, was another top notch campsite. The falls were impressive. 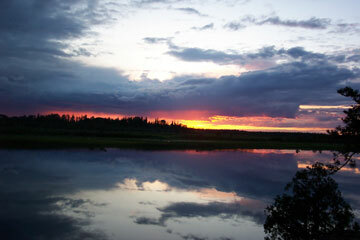 After the turbulence of Split and Thunder, the river goes for a fair distance as smooth as a mirror. 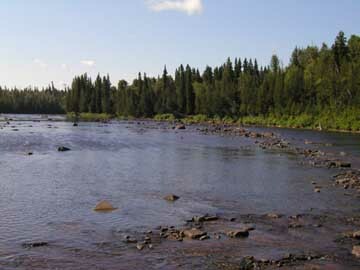 About 4 km upstream of the Brunswick Portage, the Fire River joins the Missinaibi. 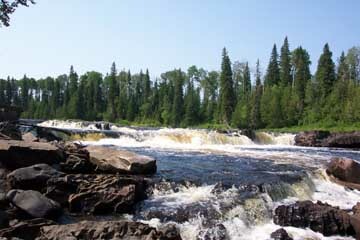 We went about a kilometre upstream to have a look at the falls. It was pretty, but not much of a drop. 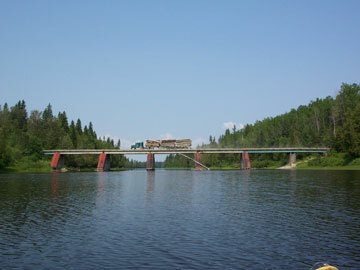 One of 3 bridges that cross the Missinaibi over its 500km length, was at this rather busy logging road. 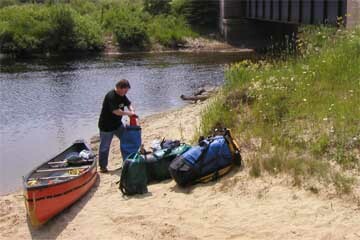 We had decided to forgo the Brunswick Portage. (Seemed like too much hassle.) 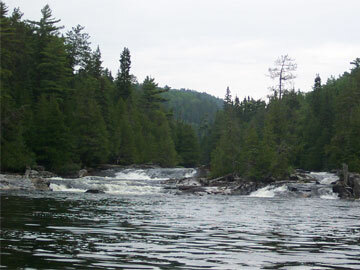 After about 35 km of paddling, we set up camp at Two Portages Falls. This photo was taken just above the excellent site. Pond Falls, a double drop, was almost as good as Thunder Falls. 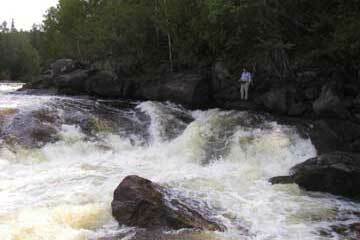 Devil Cap Falls necessitated a portage. 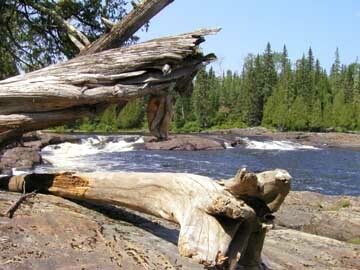 Z Drag Rapids looked okay from where we scouted it. We attempted to ride the curl in the center and dumped and lost a paddle. After bailing out the canoe, we continued. 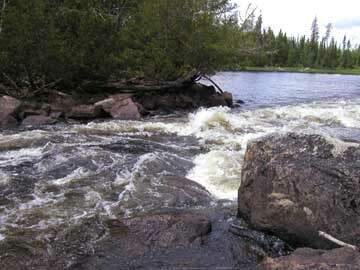 Big Beaver Rapids is quite a mess of wave, rock and drop. We portaged. 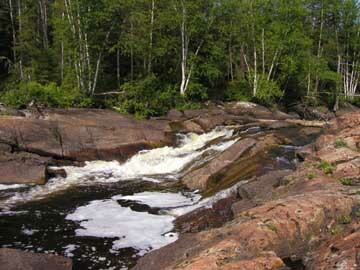 Sharp Rock Rapids is aptly named. These would rip any boat into bits. This is what you miss if you sleep in. The last, and certainly not least, falls before Mattice is Glass Falls. There is large beach on the east side used quite a bit by those who can ATV from Mattice. In the last 10 km of the trip, we went through extensive swifts and boulder gardens. We paddled under the bridge at Mattice and pulled out at the park around the corner where Owen Korpela picked us up.